The California Highway Patrol honored Phillip Gardner, the oldest licensed school bus driver in the state, for over seven decades of safe driving. Gardner turned 90 years old on March 22, and he might very well be the oldest active school bus driver in the U.S. On Tuesday, the CHP presented him with a certificate of commendation. 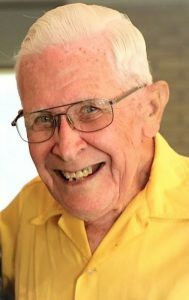 Phil Gardner just turned 90 on March 22, making him the oldest school bus driver in California. Gardner was 20 years old when he began his first school bus driving job for a private school in San Diego, California. 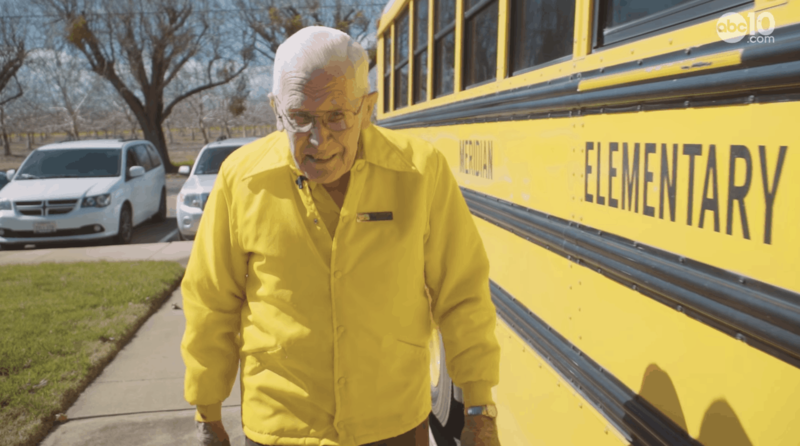 In 1947, he started driving a school bus, and 70 years later, he still hasn’t stopped. Why? Because he loves what he does. “I renewed my license the day after my 87th birthday and it will expire when I turn 92. I think I better give it up by then,” Gardner said. Gardner said he went to college to become an elementary teacher, but realized that being a school bus driver was more up his alley. In 1994, he retired as transportation manager at Yuba City Unified School District. He described himself as being a hands-on manager. When they were short of drivers, he would go out on the road and drive when he needed to. He also made sure all of his mechanics were licensed to drive too, so they could help out when needed. Gardner said he trained both John Edwards and Rochelle Laird, who are still employees at the school. Laird currently serves as a driver trainer for the school district, and Gardner said he hired her when she was 20 years old. Edwards started as a mechanic, working under Gardner for about nine years, until he retired. Then two years ago, Edwards was promoted to director of transportation for Yuba City USD. He told STN that parts of YCUSD’s maintenance program still use some of the procedures and practices that Gardner implemented in the late 1960s. Edwards remembers Gardner as being a hard worker and dedicated to his job. He said Gardner taught him a lot about the industry, because he started out with knowing nothing about student transportation. Editor’s Note: Gillig Transit Coach School Bus was a company that began in 1940 and made school buses until 1982, while mostly operating on the West Coast. Edwards said that Gillig and Gardner had close ties over the years and that the company valued his knowledge. Edwards said he recently found some drawings of Gardner’s, one of which showed a detailed scale image of the Gillig school bus and where the stripe should be placed on the bus. After Gardner retired as transportation manager, he returned to school bus driving. Currently, he works as a substitute driver for Meridian Elementary School District, west of Yuba City. However, he said he recently received a call from nearby Winship-Robbins Elementary School District to drive its school bus until a licensed driver is hired. Gardener said he will return to the road, probably next week. Video courtesy of ABC 10. A large change to the industry is the amount of training now provided to bus drivers. Gardner said it wasn’t until 1973 that a school bus driver training program was started in the state of California. Gardner said he saw a need for training at Yuba City USD, so he compiled a course of instruction and obtained his instructor’s certificate. Gardner taught training for 25 years, conducting two classes a year. Another change was in 1966, when he arrived in Yuba City. The district had just placed a lettering on the back of the bus that said, “Stop When Red Lights Flash,’’ per the new state regulation. Before that, school buses carried no warning to other motorists. He also said school buses used to have safety chains across all of the emergency exit doors on a school bus, so the kids wouldn’t fall out. However, he added that in a panic situation, the students wouldn’t be able to unhook the chains and get off the bus, so those were removed. “Do not let the behavior of the students keep you from your safe driving responsibilities,” Gardner said. He added that the kids can be distracting, but the bus driver needs to know when to pull over. Their one job is to the keep the bus on the road and to drive safe. Gardner said he keeps the kids in line by reminding them he can deny their transportation. “There is a thing in the state law that I have memorized word for word, ‘Refusal to submit to the authority of a school bus driver is efficient reason to deny transportation,’” he explained. Gardner said he has only denied transportation to two elementary-aged students for a period of time. He added that the rest of the children usually decided to do what he said. “I had one fella come up to me on the sidewalk, when he met me as an adult, and he said, ‘You were mean when you were a bus driver, but you treated everybody alike.’ I wasn’t mean,” Gardner said. Gardener said he is well-known around the community and has driven generations of families. He added he can’t go anywhere in town without someone stopping him and telling him he used to be their kindergarten school bus driver.